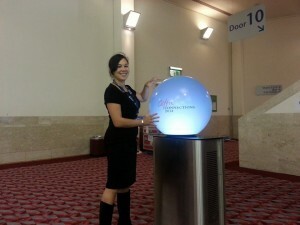 What an exciting time to play with technology and interactive experiences. We are delighted to be contributing to the Glasgow Film Festival with Sunken Ripples, an experimental interactive installation. This work is part of the EPSRC SIPS project in collaboration with Pufferfish Ltd.
Come experience the exciting cutting edge technology of an interactive spherical display as part of a new kind audiovisual performance. For the first time ever, a spherical display will be joined with the IMAX screen to create an immersive and playful experience in an underwater landscape. Join us in the world of Sunken Ripples, where interaction and touch on the spherical display ripple into huge proportions. This event is brought to you by the University of Glasgow Public and Performative Interaction Group. Tickets are available for FREE at the IMAX from 16:00 on the day of the performance. Preparations are underway to create a digital art installation during a two-day micro residency. We are busy organising SICSA’s first micro-residency, aiming to bring together artists, designers, and computing science researchers to create a piece of digital interactive art over a two day workshop. The goal of this two-day workshop is to explore ideas and concepts for a public digital art installation, creating and designing with concepts such as playfulness, performative interactions, surveillance, touch, and lighting. 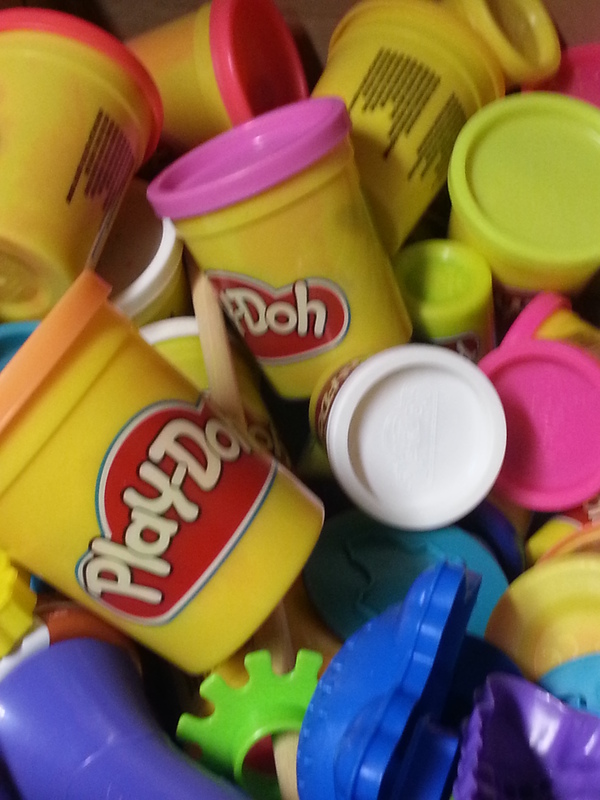 We’re gathering everything from Play-Doh and paint, to interactive lights and embedded electronics to create an installation for a public space. After a successful Interactivity at CHI 2014, Steven Benford and I were given the opportunity to feature some of the most exciting and visually compelling Interactivity exhibits in Interactions Magazine. Interactivity is a unique forum of the ACM CHI Conference that showcases hands-on demonstrations, novel interactive technologies, and artistic installations. 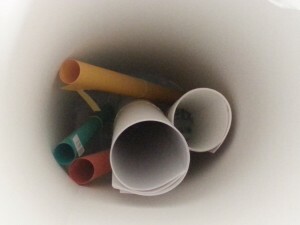 At CHI 2014, we aimed to create a “one of a CHInd” Interactivity experience with more than 60 interactive exhibits to highlight the diverse group of computer scientists, sociologists, designers, psychologists, artists, and many more that make up the CHI community. GaussBricks – Rong-Hao Liang, Liwei Chan, Hung-Yu Tseng, Han-Chih Kuo, Da-Yuan Huang, De-Nian Yang, Bing-Yu Chen. Rainbowfish - Grosse-Puppendahl, T., Beck, S., Wilbers, D., Zeiss, S., von Wilmsdorff, J., and Kuijper, A.
TransWall – Heo, H., Park, H-K, Kim, S., Chung, J., Lee, G., and Lee, W.
The Vocal Chorder – Unander-Scharin, C., Unander- Scharin, A., and Höök, K.
Check out the complete article on the ACM DL. I recently presented my work with John Williamson on pedestrian tracking as an evaluation tool for public displays. If you are interested in trying these tools for your own research, check out the documentation and tools available on my Pedestrian Tracking Site. 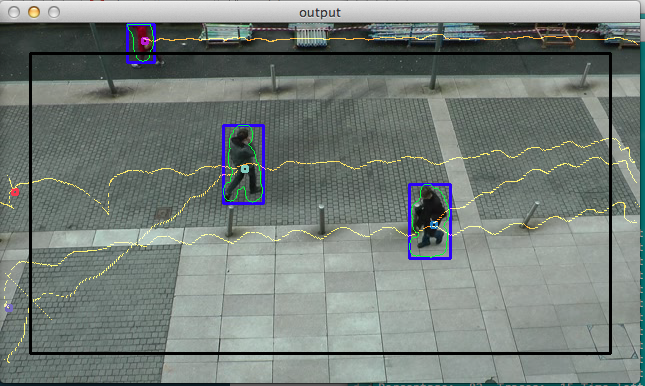 The tool can track pedestrians in overhead video, visualise pedestrian trails, and analyse the pedestrian traffic. The technique visualises pedestrian traffic and can show walking direction, speed, and path curvature. In June 2014, I will present the results of my paper on an evaluation method for evaluating displays in public spaces. The proposed evaluation technique brings together observational research techniques from sociology with social signal processing to automatically generate behavioural maps of public display usage. This technique can be used in a variety of contexts to evaluate many different kinds of public displays and is non-intrusive and non-disruptive to the interaction being evaluated. Another interesting aspect of this approach is that it can capture both interacting users and non-interacting or avoiding passers-by. Upon publication, all of the data and code used in the paper will be made openly available. Abstract: This paper presents a powerful approach to evaluating public technologies by capturing and analysing pedestrian traffic using computer vision. This approach is highly flexible and scales better than traditional ethnographic techniques often used to evaluate technology in public spaces. This technique can be used to evaluate a wide variety of public installations and the data collected complements existing approaches. Our technique allows behavioural analysis of both interacting users and non-interacting passers-by. This gives us the tools to understand how technology changes public spaces, how passers-by approach or avoid public technologies, and how different interaction styles work in public spaces. In the paper, we apply this technique to two large public displays and a street performance. 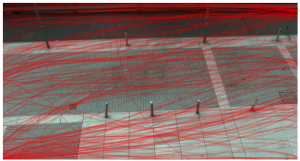 The results demonstrate how metrics such as walking speed and proximity can be used for analysis, and how this can be used to capture disruption to pedestrian traffic and passer-by approach patterns. The display is situated within a circle of interactive boxes. 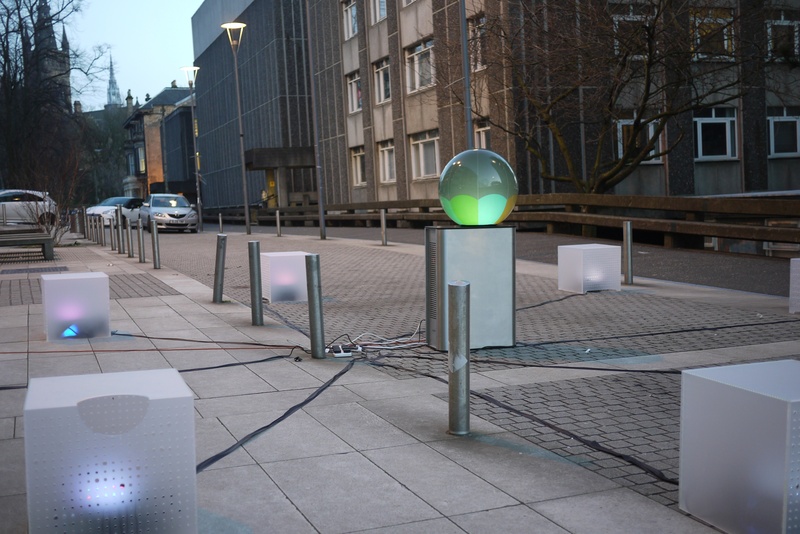 This week at the University of Glasgow, passers-by may have seen a mysterious installation in the walkway between the Boyd Orr and the Sir Alwyn Williams Building. 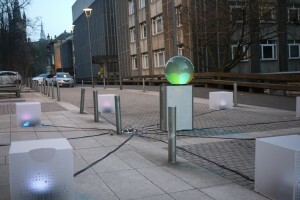 The installation involves a spherical touch sensitive display and eight interactive boxes filled with coloured light. The display is encircled by a ring made up of these boxes. Passers-by must enter the circle to touch the display and explore the installation’s interactivity. 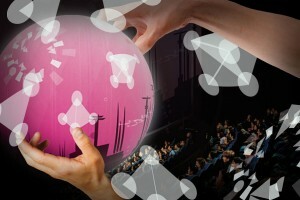 Each box can be controlled by interacting with the sphere. 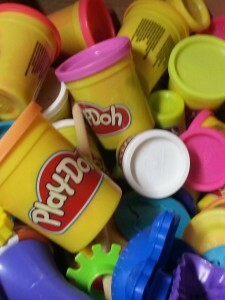 The installation explores issues of playfulness in public spaces, environmental control, and discovery of interactivity. 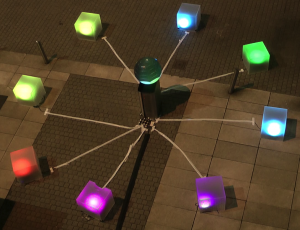 We have placed the installation in this public space in order to understand how passers-by engage with an unknown interface in a public space, what they do when confronted with something playful in nature, and how they explore its capabilities. This work comes from a five month collaboration between the University of Glasgow and Pufferfish Ltd in Edinburgh. The project revolves around understanding how novel display form factors influence how these displays are used in public spaces. After the Celtic Connections deployment, we were able to contribute an article about some of our tools and techniques for working with the PufferSphere®. The article is part of the a day in the software life blog series at the Software Sustainability Institute. This week, I published an article in LNCS Mobile Social Signal Processing that describes using performative actions as input in mobile settings. I had never focused on social signal processing in my work until Alessandro came to the University of Glasgow and I realised there was some interesting overlap in multimodal interaction design and social signal processing. So here is my first article looking at social signal processing for performative interaction. Abstract: Capturing and making use of observable actions and behaviours presents compelling opportunities for allowing end-users to interact with such data and eachother. For example, simple visualisations based on on detected behaviour or context allow users to interpret this data based on their existing knowledge and awarness of social cues. This paper presents one such “remote awareness” application where users can interpret a visualization based on simple behaviours to gain a sense of awareness of other users’ current context or actions. Using a prop embedded with sensors, users could control the visualisation using gesture and voice-based input. The results of this work describe the kinds of performances users generated during the trial, how they imagined the actions of their fellow participants based on the visualisation, and how the props containing sensors were used to support, or in some cases hinder, successful performance and interaction. 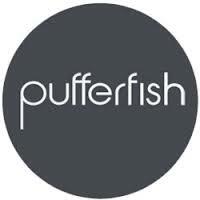 As part of my current project, I am working with Pufferfish Ltd to evaluate spherical displays in public spaces. One of our exciting installations combines my research and my love of Scottish music. 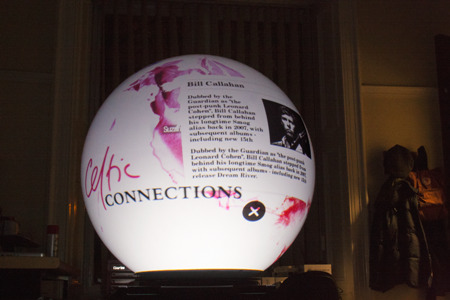 We’re working with Celtic Connections to install the PufferSphere display in the concert hall for the whole opening weekend of the festival. It’s an exciting place to be and also my first public engagement since starting my SICSA Fellowship. It’s been a wild ride but we’ve pulled it off with style. Visitors to the 21st Celtic Connections festival will have the chance to hold the world in their hands at Glasgow Royal Concert Hall from today (Thursday 16 January). Researchers from the University of Glasgow’s School of Computing Science have teamed up with Edinburgh-based display developer Pufferfish Ltd to create an eye-catching illuminated globe which will provide information on 25 of the festival’s top acts. A computer-controlled display will project a high-resolution image of a world map onto the 600-mm spherical display’s touch-sensitive surface. 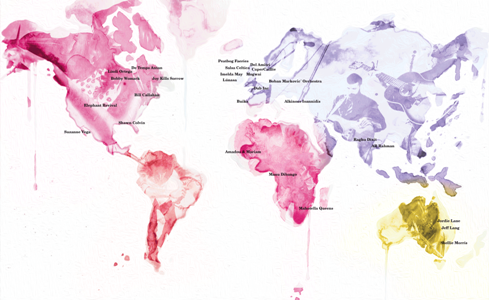 Users can ‘spin’ the image, which is marked with the locations of artists’ home cities, and tap on artists’ names to find out more about their work and festival gigs. In addition to providing an unusual source of useful information to Concert Hall visitors, a set of small cameras placed around the display will provide the research team with feedback on their reactions. 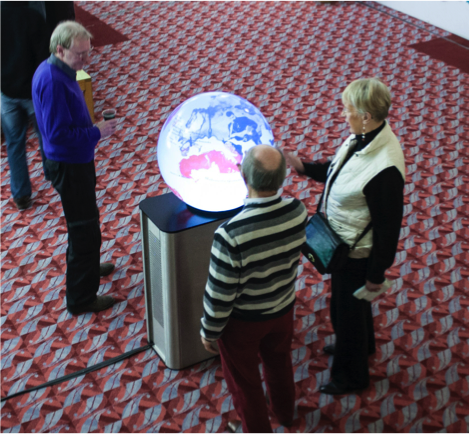 Research associate Dr Julie Williamson, who led the project, said: “This is the result of four months of work to develop the content to show on the PufferSphere display and determine how we could best measure visitors’ responses. “We’re really interested in finding out more about how technology influences pedestrian traffic in public spaces, a process we call performative interaction. We want to know how long people spend at the display and whether they use it alone or in groups. We wanted to get involved with Celtic Connections because it attracts so many visitors from around the world and we were delighted when they agreed to help. Dr Williamson worked on the project with product designer Daniel Sundén and Pufferfish Ltd’s software manager Dr Jay Bradley and sales and marketing manager Ben Allan.